Is it possible to find a murderer through the analysis of his writings? Imagine you are a detective who faces the search of the murder of a young woman. There are no traces of the crime, only a series of letters the prime suspect has sent to his mother but which does not contain any information that could lead to evidence of any kind. Where would you start looking for clues? This is the problem the protagonist of the film “The Secret in Their Eyes” faces. It took years for a person to analyze and identify that, within the letters, several names are mentioned, apparently unconnected, but referring to players of a famous football team; discovering that this was his passion, the detective then knew where to look. When you put together a puzzle, you seek to build a whole out of a set of parts; when you analyze something, you are doing the complete opposite. To analyze, we begin with the whole picture, knowing every possible detail, and then we break it up or separate it into different parts. But why should we unfold or resolve a puzzle? It helps us to know how each part works, how they relate to each other and, in turn, to the whole. We analyze to understand. We start from something concrete (a whole), to get to the abstract; i.e. everything that can be created with our thought: concepts, hypotheses, laws and theories. You may not be a detective in search of a murderer, but when reviewing eLearning content, you will have an intention in your mind: to gain knowledge, understand, discover and find the meaning in that which you’re reading and learning. This way, content analysis will make it possible to establish a clear and comprehensible structure of the content’s sequence, allowing us to define the objectives, and if necessary, a glimpse of the teaching-learning strategies that we can use. Right now, and unconsciously, your mind is processing and storing the information you read in this text. Your brain is creating a map that gives structure to the data it’s receiving. It does this in order to find meaning and establish a frame of reference within the set of concepts and ideas you already have. Have you noticed that when you don’t fully understand a section of text, you stop and read it again? You do this in order to place it somewhere within the mental map that is building up, albeit temporarily. 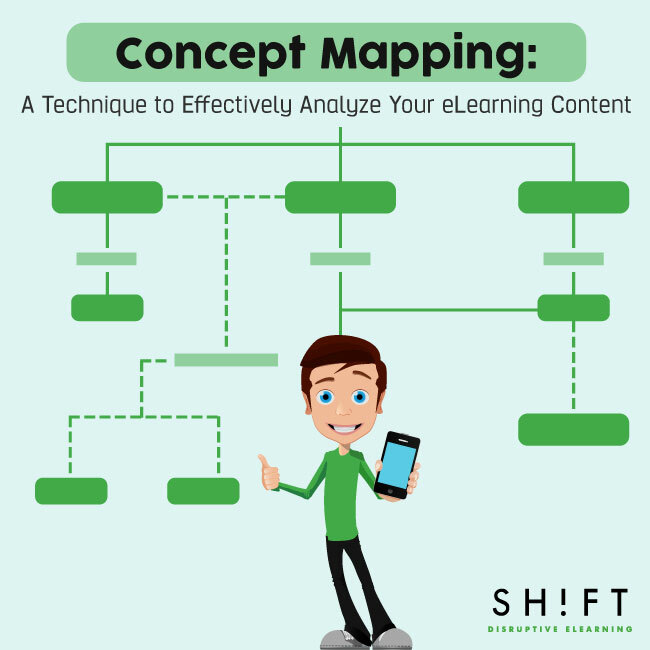 Content analysis in Instructional Design can be performed by various mapping techniques, such as concept or mind maps. The concept map technique, created by Joseph D. Novak, presents us with knowledge that is organized and represented in all levels of abstraction. This means that the most general and inclusive concepts are located at the top and the less inclusive, in the bottom. When utilizing concept maps in the initial curricular planning process, developers and educators gain a comprehensive understanding of what students need to learn (McDaniel, Roth, Miller, 2005). Concept mapping used as a planning device for instruction may provide suggestion for an appropriate sequencing of instructional material (Clark & James, 2004). Your map will allow you to easily identify the type of content that prevails, such as: declarative, procedural or situated; and the relationships between concepts: superordinate (hierarchical relations), coordinated (horizontal relationships), or subordinate (vertical relationships). It is essential to distinguish between main and supporting ideas in the text. The scheme must represent faithfully the ideas expressed in the contents. Comply with the hierarchy that exists between ideas. Do not include irrelevant information on the topic. 2. Define the most important topic or concept, and place it on top of the map or highlight it somehow. .
3. Once the key topic has been determined, then place in order those which are subordinate to it. 4. Using arrows, set the relationship between the general concepts and subordinate concepts (hierarchical relationships); and the relationships between where concepts cross (vertical and horizontal relationships). 6. Choose the "link" words to relate a concept to another and place them on the arrows. 7. With these classifications made, sketch a first-draft map. Work it at least once more to ensure there are no missing items. In the film, someone had to recognize the relationship and structure of the names on the cards through a mental map, which revealed that they were all team players. It was this that allowed them to get the final clue and finally track the suspect. Diseñadora instruccional especializada en programas de formación en línea. Su interés es el estudio de estrategias para facilitar el aprendizaje.